Last Saturday, Daly City officials and residents convened to celebrate a newly built transit plaza, the centerpiece of the long-awaited $3.4 million Top of the Hill project, which includes a series of pedestrian and streetscape improvements along three blocks of Mission Street between John Daly Boulevard and Parkview Avenue. The project was constructed with $2.3 million from the Metropolitan Transportation Commission and $700,000 from the San Mateo County Transit District (SamTrans). Top of the Hill is the most significant street re-design project carried out to date as part of the Grand Boulevard Initiative, a collaboration between 19 different public entities that seeks to improve walking, biking, and transit, and to enable transit oriented development that can help reduce traffic congestion along El Camino Real from Daly City to San Jose. Because San Mateo and San Francisco counties operate separate transit systems, bus riders traveling between Daly City and San Francisco are forced to transfer at the county line (except those riding SamTrans Bus 391, which serves downtown San Francisco). The new Centennial Transit Plaza, named in honor of the city’s 100th anniversary in 2011, is located on the northwest corner of John Daly Boulevard and Mission Street. It’s one of two important transfer locations in Daly City, serving 600 to 800 SamTrans bus riders every day. The other transfer location – between the SamTrans, Muni, and BART systems – is the Daly City BART Station, located a half-mile to the west. People can now walk across Mission Street on the north side of the intersection, where a red-brick crosswalk replaced "No Ped Crossing" signs, to access the new transit plaza. Photos: Google Maps (left), City of Daly City (right). The transit plaza replaces a single bus shelter, which included only three seats and blocked half the sidewalk, with a much larger green-roofed pergola structure that includes more plentiful seating and new bike racks. The structure features roof-mounted solar panels and digital displays that provide real-time bus arrival information. A new bus shelter was also added to the southwest corner of the intersection, replacing one in a less visible and secure location. On average, one person per month is injured in a traffic crash on Daly City’s one-mile long Mission Street, which is the northern end of El Camino Real in San Mateo County. One-third of those injuries are sustained by pedestrians or bicyclists, and between 2009 and 2012, more people walking and biking were injured on Mission Street than on any other street in the city, according to the Daly City Police Department. To improve safety for pedestrians, the Top of the Hill project includes a series of sidewalk, crosswalk, and median upgrades. The new wider, landscaped medians on Mission Street from John Daly Blvd to Parkview Avenue. Photos: Google Maps (left), City of Daly City (right). The sidewalk on the west side of Mission Street was widened from Theta Avenue to Parkview Avenue, and trees were planted along it. The sidewalk on the east side of the same section of the street had already been widened when the eight-floor, 95-unit, mixed-use Landmark Plaza development was completed in 2009. 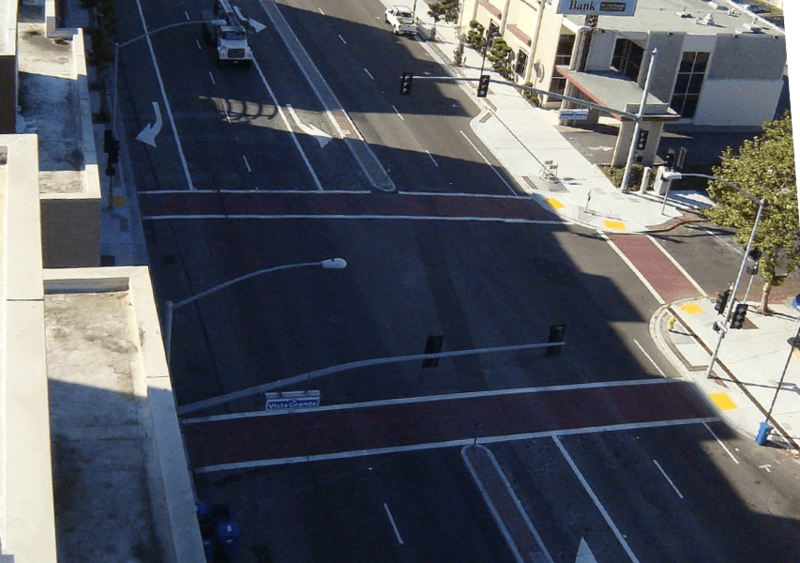 Curb extensions were installed at each of the Mission Street intersections in the project area — at John Daly Boulevard, and Theta, Vista Grande, Alp, and Parkview avenues — reducing crossing distances for pedestrians and improving their visibility to motorists. The central medians along Mission Street were also widened and planted with trees and shrubs. 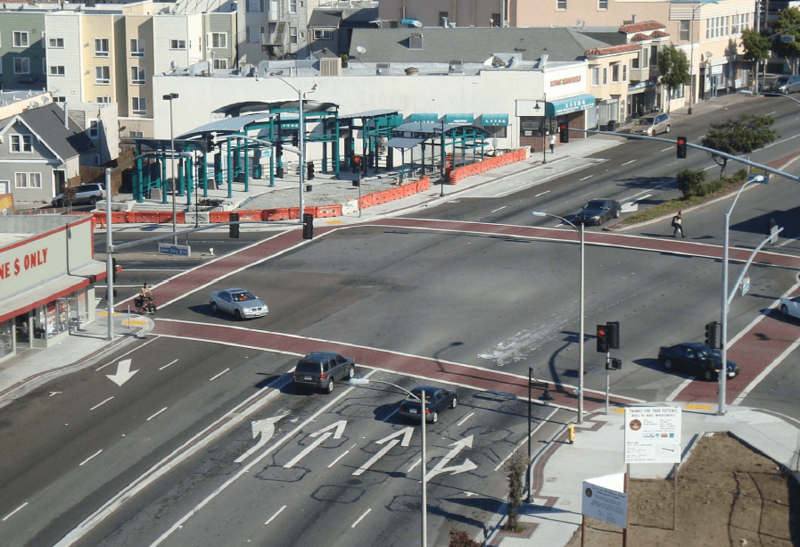 On the north side of the intersection of John Daly Boulevard and Mission Street, “No Ped Crossing” signs — which previously forced pedestrians to make three street crossings in order to get across Mission — have been replaced by a new crosswalk. A crosswalk was also added across Mission Street on the south side of Vista Grande Avenue, where identical “No Ped Crossing” signs had prohibited crossing there as well. Mission Street in Daly City is part of El Camino Real, which is a state highway, meaning Caltrans review and approval is required to make any changes to the street’s design, including adding crosswalks. The Grand Boulevard Initiative’s Complete Streets Project, currently underway and managed by SamTrans, picks up where Top of the Hill left off, calling for similar but even more effective streetscape and transit improvements on Mission Street from Parkview Avenue to School Street, a section twice as long as Top of the Hill. That project requires more extensive collaboration with Caltrans because it will include several proven safety improvements that are nevertheless prohibited by the agency’s Highway Design Manual. These treatments include narrower travel lanes, smaller curb radii, and narrower curbside planting strips and planted medians. Awhile ago Caltrans approved a road diet and bike lanes for the few blocks of San Jose Ave a bit north of here, just inside SF city limits. Anyone know if this project is still on track? As streetscape improvements, these sound great. As transit improvements… this new center should not be seen as lessening the importance of moving the terminus for the Muni lines to the BART stations — not just the diesel ones but the trolley buses too. Welcome news. I look forward to someday building a crosswalk across John Daly Boulevard at Niantic, so that folks going to and from BART don’t have to use the tunnel to get across John Daly. Samtrans provides a commuter extension of the 391 and full schedule downtown service along the Bayshore Corridor on these routes : 292, 397 (Owl), and KX (link to timetable page below). Also, for the hair-splitters, the ECR (southbound) and the 120 (southbound) serve a token stop at Mission + Sickles. NB – The county line is a quirky beast. The street grid does NOT follow the border. So the street signs change color along San Jose Ave. as one walks from Wilson to Goethe. Same goes for Mission Street as one walks from Templeton to Sickles / Acton. And again for Bayshore Blvd. as one walks from MacDonald to Sunnydale. SFMuni’s terminus for the #14/#14L/#14X is a couple of blocks inside Daly City’s limits. And the plaza is another block further south and slightly west. Daly City is pretty clear that they’re not interested in having the 14 trolley bus going to BART. Also Daly City BART would need to reconstruct the bus area to expand capacity for the 14. However SamTrans will expand the weekend ECR line to run 7 days a week later this summer so that SamTrans riders can directly transfer to both the 14 and BART, rather than the current arrangement of having a route (390) connecting directly with BART and another (391) with the 14. With this change, SamTrans will no longer run a bus on Mission to downtown SF. Yes – this gets to a major disadvantage of trolley buses – catenary! (I know, it may not be ugly to transit users – in fact, it’s an easy way to trace the route, but to others, it is an assault on street aesthetics). Better than the assault of diesel fume aesthetics. When I moved to D.C. in 1988 or so, I went to a meeting held by MUNI that wold have brought the Mission St. trolley buses to the BART station – that’s where I learned about the argument against the catenary. Apparently they had just buried utility wires on John Daly Blvd. I think MUNI realized this was a batte that couldn’t be won. Later I read of a planning meeting in S.F. to do much the same thing, though I don’t recall the lines in question. I’ll always recall what one resident said when it was brought to the public’s attention of the zero-emission benefit of the trolley buses. “But our air is clean here in western S.F.”. There you have it: Human Nature – we think primarily of our own quality of life, not others….